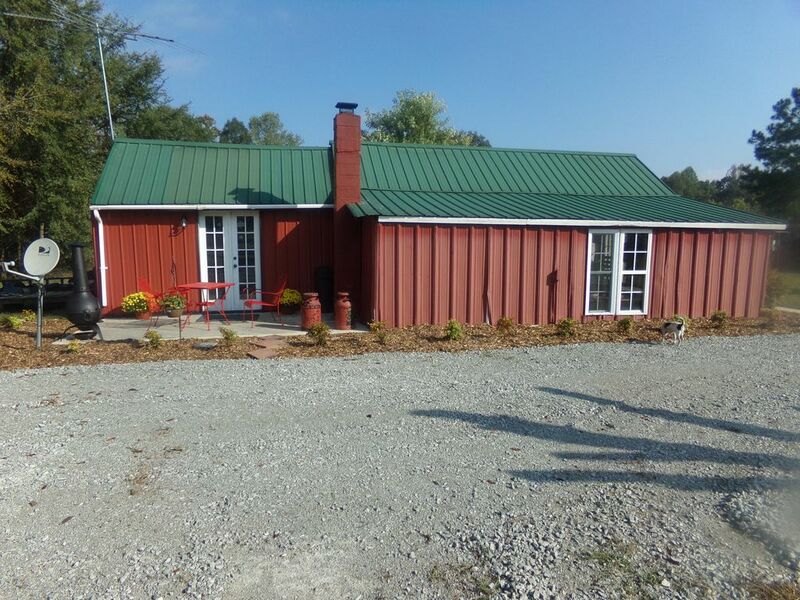 Converted pole barn, approximately 1200 square feet. Completely furnished. Living area, dining, kitchen, bath, shower and full size bed with twin bed in alcove. Many unique antiques. Vintage pinball machine, pool table, multiple board and card games. TV on antenna, clear picture of 14-15 channels, VCR, WIFI. Security camera. Piano and tread mill. Wood and electric heat for winter, air conditioned for warm months. Patio off the bedroom with chimenea, table and chairs and charcoal grill. Horse shoe pit, with multiple seating venues to enjoy in the beautifully landscaped yard. 5 Minutes from boat docks for easy access onto Tims Ford Lake. Close to University of the South in Sewanee, Tennessee. Mid-way between Chattanooga and Nashville, Tn. 1 hour from Huntsville, Ala. Boating, kayaking, hiking, walking and biking trails close to the cabin. Quiet and cozy but easily accessible to shopping, restaurants and sight-seeing. Bath towels and wash cloths, bed linens, kitchen towels, dishcloths, dishes, cups and glasses, cooking utensils and flatware all included. Full size refrigerator, convection toaster oven, microwave, coffee maker with filters, toaster, standing mixer with plenty of large mixing/serving bowls. Antique English wardrobe to hang clothing. Extra comforters and pillows in wardrobe. Hairdryer. Healthy clean air. Minutes from Tims Ford Park and lake. Short drive to Jack Daniels in Lynchburg, Tn and George Dickel in Cascade Hollow Normandy, Tn. Discounts with local kayak companies for Holliday Hide Away guests. We raised our three children here, and then grandchildren came along and to them this is home. Now with the 3rd generation of the Holliday family, it remains the gathering place every Sunday afternoon. We love our little place on this earth and enjoy sharing with family and friends and now offer to share with others. My husband and I have been married 48 years now, met 50 years ago. We love laughter and simple life and have spent the last 38 years designing our property for our enjoyment and the enjoyment of others. I am an author of a juvenile mystery series and my husband is now retired. I continue to work at my chosen field of nursing and look forward to weekends when we spend time together with family and friends. Guests are welcome but, we do not impose. Your time in our cabin is private. We are available in the main house for any questions or assistance if needed. wood stove and wood provided. Electric heat in bathroom. Infrared heater in bedroom if needed. Ancillary heat rarely needed. Wood stove keeps cabin cozy and warm in the coldest weather. Apartment size portable washer available to hook up if needed. Plenty of clean, fresh towels and washclothes available. Cozy living room in main room. Couch, double chair and rocker available for comfortable seating. Large screen television on antenna. Picks up local channels and approximately 14-15 channels clearly. Assortment of books available for the reader. Pool table and accessories. Multiple board and card games. Horse shoe pits and horse shoes. Dart board and darts, checkers. Unfortunately the pinball machine is out of commission at this time. Stereo and large collection of CD multiple genres. Beautifully landscaped property. Multiple seating venues throughout. Comfortable swings x2 and hammock for two. Bring your bicycles and enjoy the multiple riding trails within minutes of this property. No bicycles provided by property owners. Boat rentals available at the multiple marinas in vicentity. Attached patio to bedroom. Table and chairs, charcoal grill and chimenea on patio. Multiple golf courses within 15-20 minutes of property. Holliday Hide Away is located close to town but hidden away in beautiful Winchester Springs in Franklin County Tennessee. Get away from the hubbub of daily grind for a romantic retreat. Multiple resturants available or bring your own food preferences to prepare. Enjoy hiking, boating, biking, sightseeing or shopping, whatever you desire is within minutes of this unique property. Very clean and very spacious. The rustic decor made you feel like you escaped the hustle and bustle of the city. Plenty of games to keep the family occupied. Perfect for a weekend unwind. Unusual but cozy and memorable place to stay. We will be back soon! We heard about this place from friends who had just stayed here and thought we would try it out. So much better than any motel room. We played many games of pool and pinball. And just relaxed for a few days. We will be back soon. We are very happy to hear that you enjoyed our cabin retreat. Thank you for the sweet note you left in our guest book and we hope to host you again. My husband and I thoroughly enjoyed our stay here. The house feels more like a family guest house than a vacation rental. It is so welcoming and comfortable. The wood stove keeps the home very warm. We played a lot of pin ball and pool, and had everything I needed to cook breakfast and a light supper. We came here to relax and unwind, and we did exactly that. We explored the area a little. We toured both the George Dickel and Jack Daniel distilleries nearby and enjoyed both, but the main goal was to relax at the house which was perfect for us. Deb was very quick to respond to any questions we had. I highly recommend this home for your stay. We stayed for 5 days and 4 nights and I couldn't be happier with our stay. Easy to get around the town and someone always around for questions or help. We highly recommend staying if one needs a quiet, peaceful stay. We look forward to booking again soon. It was a Christmas weekend get away for us and your quaint cabin was the perfect place for us! We loved snuggling up in front of the wood burning stove to watch a movie after our adventure for the day at the Jack Daniels Distillery. We hope to return soon for another get away! We are so glad you enjoyed your visit and we look forward to seeing you again.